This building was the first of three buildings completed for John Romney, who envisioned a strong presence, expressed structure, and natural materials resonant of historic mountain towns for Building 32. With recessed entries and welcoming transitional spaces, the ground floor is designed for window shopping. A corridor through the building connects the street-front pedestrian circulation to parking in the rear. 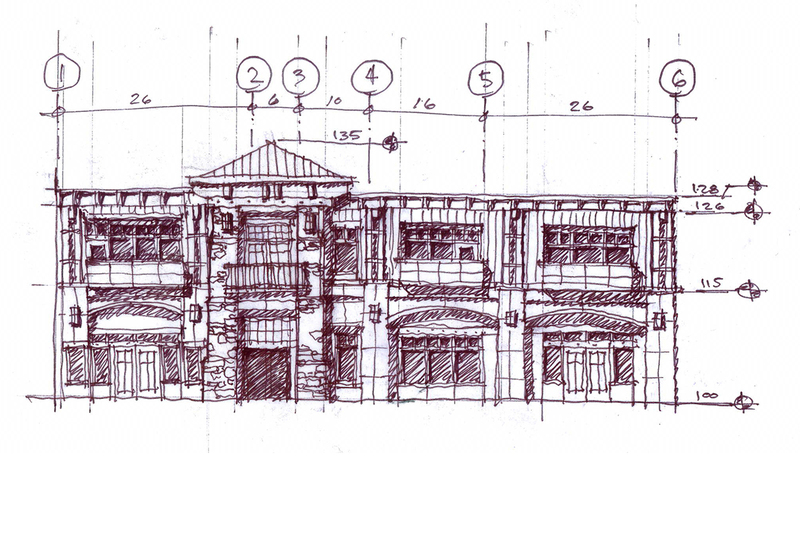 “My company completed three mixed-use, commercial/residential projects encompassing an entire square city block in Big Sky’s Town Center with Bechtle Architects. We worked with Scott and his team from the initial concept design, through the bidding and, ultimately, the construction process. The Bechtle team designed buildings that complimented one another and created a wonderful ‘look and feel’ across the entry corridor to Town Center. We worked collaboratively throughout the design and bidding process in order to make sure that we were able to keep within our budgets and still achieve our original vision. Once the construction process began, Bechtle Architects – Ben Elias, in particular – was actively involved, clarifying items as needed to keep the project on track and, as importantly, providing our company with an additional level of oversight on the project. Ben’s attention to detail and construction experience was invaluable in this area.